While I have never been a very active member here, I have always taken inspiration from this site. By way of giving back, I wanted to share a project that my twin brother and I have been working on. Since we were children, the two of us have been very interested in making terrain. We have always wanted to make a large dwarf mine as a centerpiece, but years went by without any serious effort being applied. This changed a few months ago. 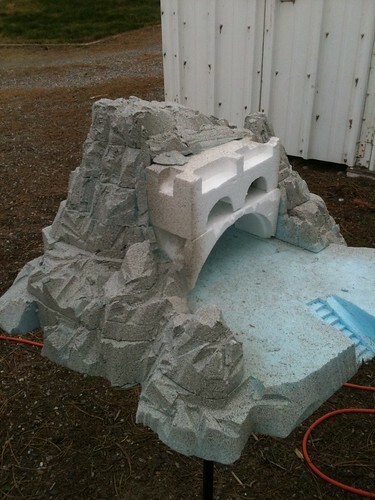 Two-and-a-half full sized sheets of styrene foam, the medium I had in mind for a model mountain, blew into the parking lot at my work. It appeared without any explination, literally carried on the wind, and deposited itself like manna from heaven. After a few days making sure no one would claim it, I kicked it into smaller pieces and took it home. It filled my car darn-near to the brim. 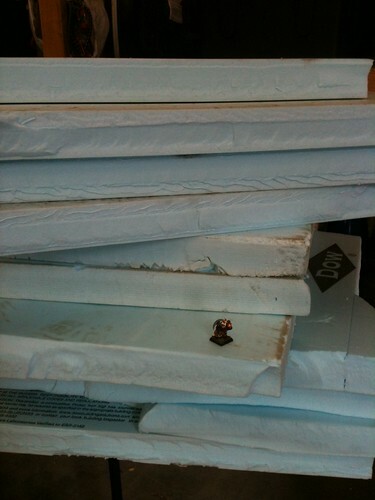 Shortly after, I began work on the long dreamed of project: The Dwarf Fort. 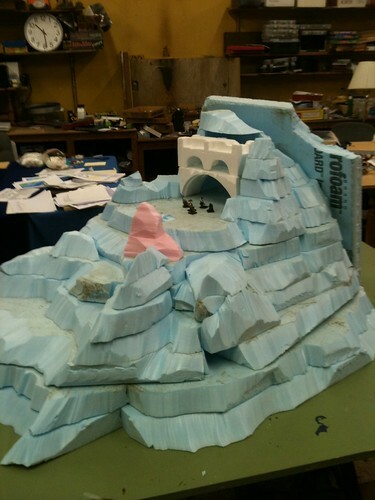 The basic idea was to carve a mountain out of foam that would be made out of stacking layers. The edge of each layer would contitute the exterior, and nested in each layer would be an interior floor of mines or dwarven workshops. 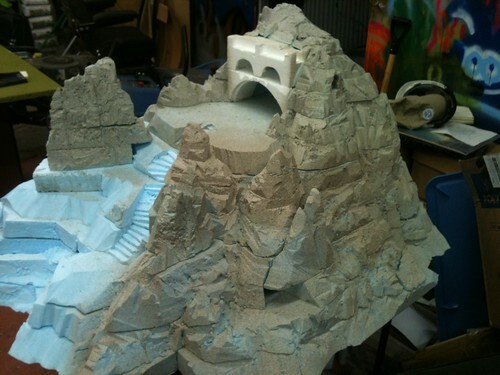 All stacked up, it would create a huge terrain piece; Inside, a detailed dwarf settlement, carved into the mountain. 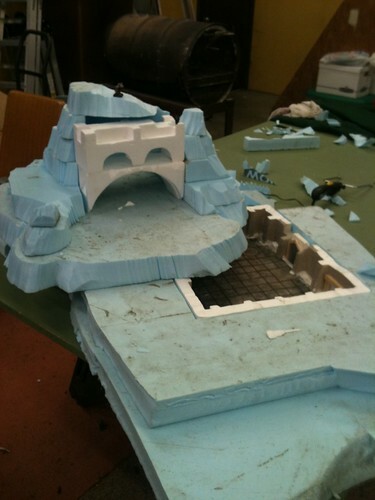 I have begun work on the outside, and my twin in Seattle is constructing the insides. We have been working for about four months, and expect to be at it for many more until the project can be called finished. It has been very challenging and exciting, and I hope everyone can enjoy our little offering. The first day on the job was very tricky: I didn't know where to start. I had just bought a load of foam cutting and gluing tools at the local model railroad store. I was big on material, but low on direction. I eventually pulled myself together, and over the next few days cut my way towards the peak of my hill. 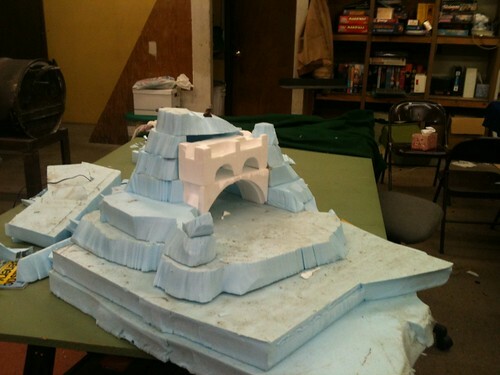 I incorporated some likely foam pieces that looked like arch ways, and had a rough idea of how to proceed. There is lots more to post, I'll show the next part of the project tomorrow. Stay tuned. Edited by Steven, 30 May 2012 - 06:42 AM. Looks awesome! Good to hear that you finally decided to chase your dreams and make a dwarf mining fortress! So far I have no critisisms. Everything is perfect! 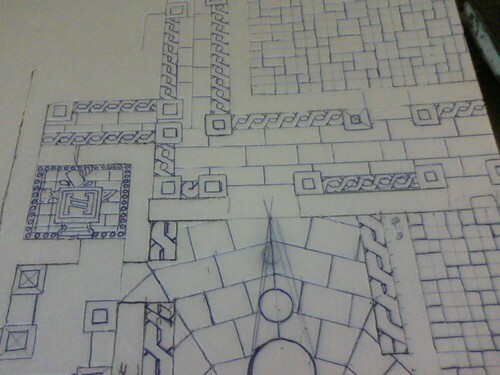 Now let's see some pillars and decorations! Looks amazing! Sounds a great idea, can't wait to see some more progress. Have you considered how this would work in a game yet? Wow, extremely impressive work! I'll highly enjoy following this. Have an ale on my tab as a reward for all the hard work! That's looking great, keep it up! Well you misspelled "explanation." But besides that I can independently verify everything he said as true. Except insofar as "We have been working for about four months" makes it sound like we have been *working* for four months. I myself *started* working four months ago, but have by no means been actually progressing steadily since then. I would say I have done like 2 weeks of work. 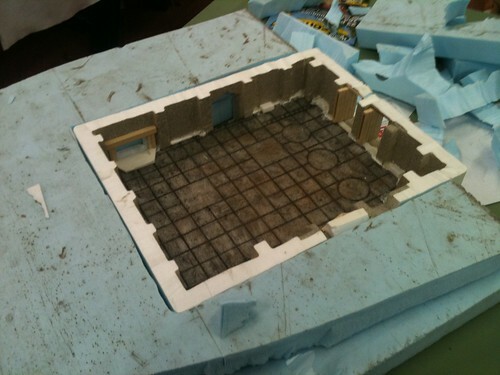 My contributions have all been foamcore-based. My format for the interior is to take strips of foamcore, peel off the card-paper from one side, and use a pen to score the exposed foam. 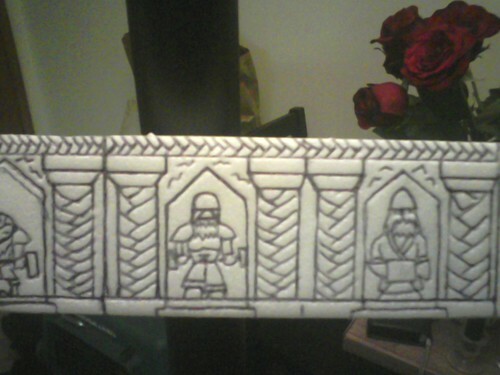 I carve stone patterns into the foam and use these carved strips to make the walls and floors. The idea is to have 3 or 4 levels. First, the Great Hall pictured above. Then, a Forge Level where industrial equipment is kept. Next, a Dorm Level where there are living quarters, stores, eating halls, and armories. Bellow that will finally be the Mine. 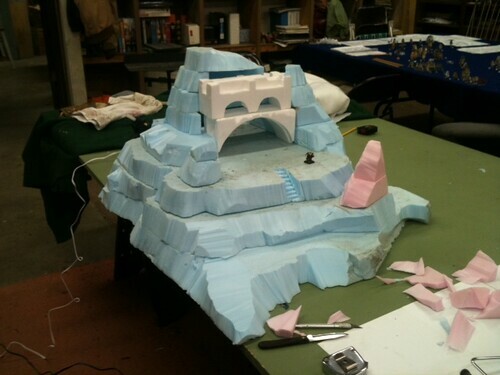 Each level down will have a bigger floor plan than the one above it, contributing to the cone shape of the mountain. I have been working on the dorm level and am getting doneish. Some pictures will be posted, probably by Steven (he has an iphone and can do fancy stuff like that). Thanks for all the support and positive feedback! You guys make me want to work harder. 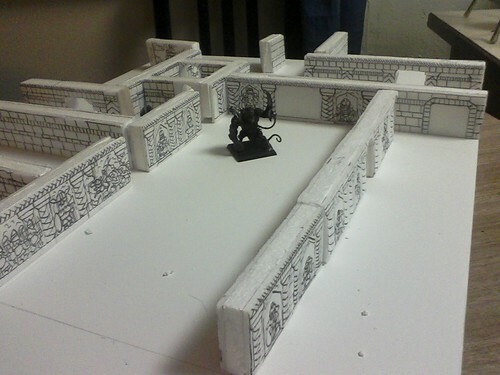 A mock-up of the walls can be seen here, complete with a deadly intruder! This "dorm level" is approaching completion, which is very exciting. Daniel (Steven's Twin) will be adding small buttresses and protruding pillar and such to add three-D effects to the otherwise flat walls. Painting is not being looked forward to by either of us, as we are not sure how to proceed. Advice welcome! 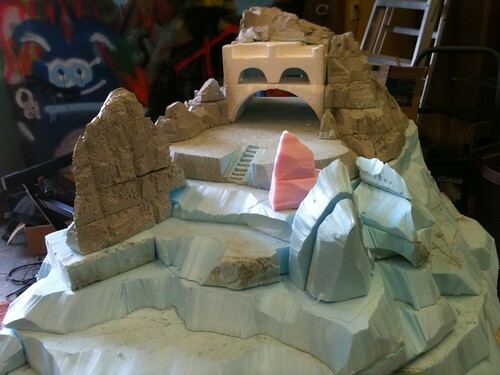 Up Next: work on the outside progresses, and the mountain grows! At this point I wanted to make it a layer or two taller, but as each successive layer was wider than the one before, I ran out of foam. The backside of the hill was kept open. The plan was to make one solid piece covering this up. 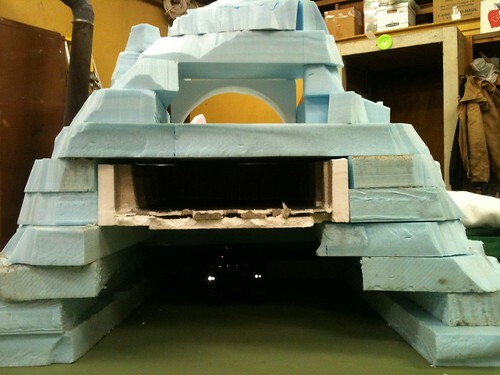 This "back plate" could be removed easily, giving a cut-away view of the whole interior. This back plate is still undone. 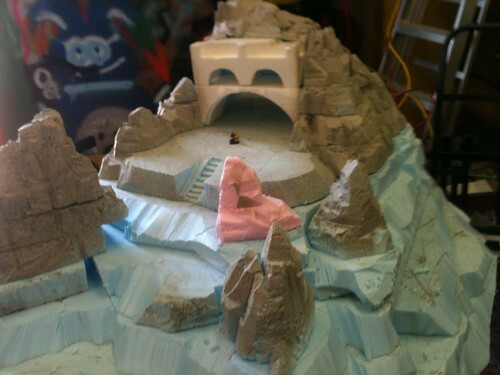 I the bottom of the cavern is a Baneblade for scale, with headlights. Up next, the outside is refined and textured! There is something beautiful about this hobby. That rush of insanity when we have a creative idea; like we did with milk cartons and toilet paper rolls when we were kids. The absence of the hobby, creating a hunger deep inside us that we finally find time to satisfy until our hands are surfeit with the wounds of creation. It's that burning creativilty that wells up inside us like the fires of our own forged fantasies, and the residue of surrmountable problems we encounter along the way, that leaves a mark on our souls. A mark that proves we are more than just the jobs we work every day. You have embraced the magnitude of fevered vision, seized the day and opportunity, and begun something great Steven- you should be proud. <Edit> Forgot to add- concerning painting it all. 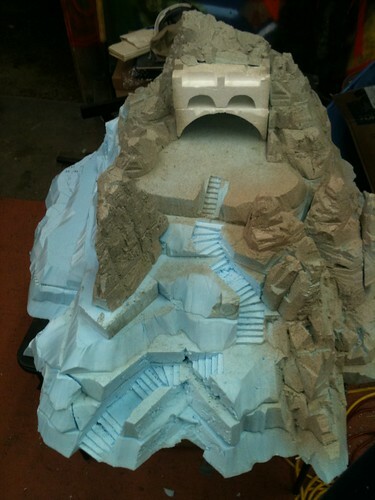 Hoengarden is the resident terrain master imo, so you may want to take a look at his posts. Edited by Wendersnaven, 31 May 2012 - 12:46 PM. 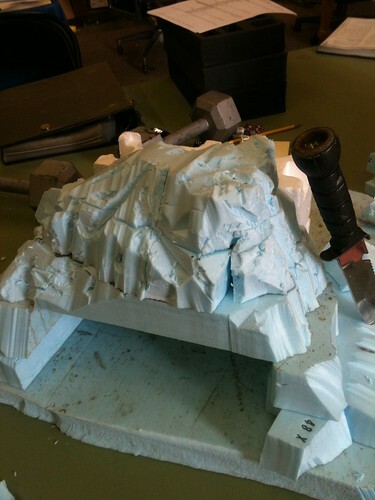 It's almost as if all the constructions we made with milk cartons and toilet rolls prepared us for this, the day when we would look on the internet at pictures of a Dwarven hold made from styrofoam... it makes want to make one myself! I agree with the previous posts -this is going to be epic. Well done so far. Have a few on my tab for the effort & then get straight back to work. Can't wait to see this progress. So excited by this project, the murals are crazy!! I definitely like where this is going. Hopefully one day I will have the time to build my own (and a hobby room all to myself lol). Wendersnaven, you are a scholar and a gentleman. You put into words what most of us, I'm sure, feel is the best part of this hobby. Bravo. Thanks to everyone for all the great support so far, I am so happy I can share this with you. When we last left our work-in-progress, we had reached the stage I like to call "The big blue potato" for the shape and color of the fort in it's full size. I was unhappy with the overall effect, while being very pleased with the bulk of it's size. It looked more like a mound and less like a rocky crag than I wanted it to, and it was with this in mind I moved on to the next phase. You can see the delicate tools I used in my precision. This brought the top layer up to the point that it is at presently. I really like how it's starting to work out. 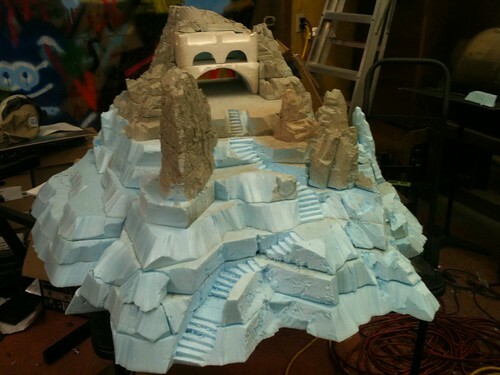 Tomorrow I'll post the most current pictures showing the face lift I gave the rest of the mountain and the work I've done carving parts of it. Once I saw the top section all dolled up, I was very happy. I wanted to rest of the mountain to look more mountainous, so I went back and added on some peaks and rough patches, to break up the shape. These little bits were then given to the knife and sprayed down to complete the effect. I figured carving bits up needed to be done all at once to prevent lines of discontinuity, so each peak was carved at once. With moral fully boosted and feeling on a roll, I set about carving the whole right side of the mountain. Over several nights I shucked and ripped and stabbed the boring foam side into submission. After this, I wanted to continue the work around the front, but I had a thought that stopped me. I wanted to make a stair case leading up to the mouth of the fort. I had put a small bit of steps on the top section, and thought this should continue all the way down. 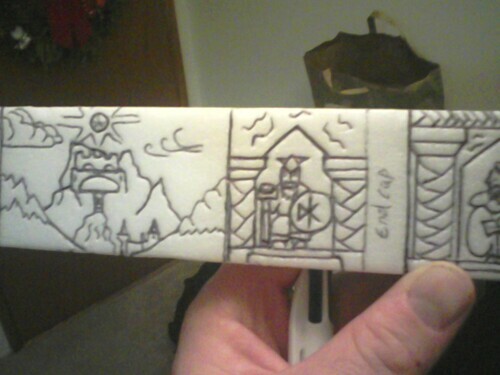 Not wanting to waste effort carving area that would be later turned into steps, I carved the steps first. It took hours. Handling the razor blades without a grip and cutting at weird angles was tough, but I made it through without any blood lost. Again, I was happy with how it turned out. 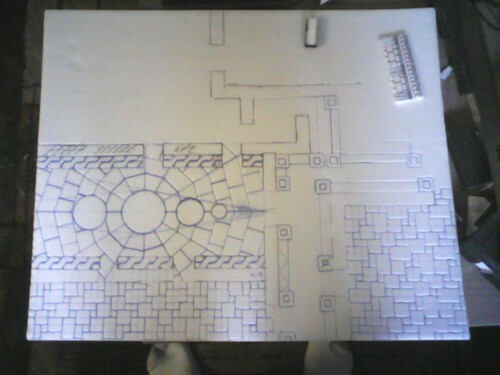 I left some spots for fortified landing, and may add gates and watch towers along the approach, when all else is done. Finally, I spray painted the parts I had done. And this brings us to today. All of this has happened over the last few months, especially since I finished classes six weeks ago. Up next on the agenda is to finish up the texturing on the front and left face. I'm heading over to the shop tonight and tomorrow, so hopefully there will be more progress to show by Monday! I'm looking at the gatehouse rampart towards the top and see two 6" wide spaces between the crenellations that would fit the BFSP dawi fence very nicely. In fact those fences would fit everywhere nicely... 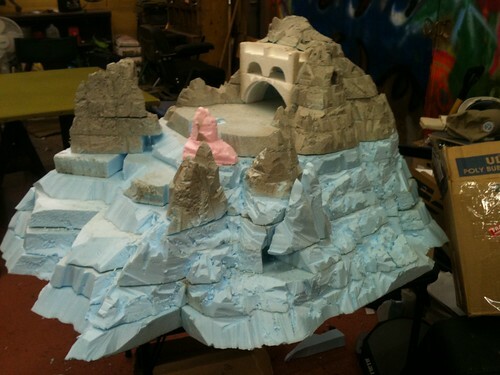 It's probably too early for detailing, but are there things you are keeping in mind as decorations as you build the functional mass of rock? Länd Gameboards: New Ready Made Battlefields Concept.